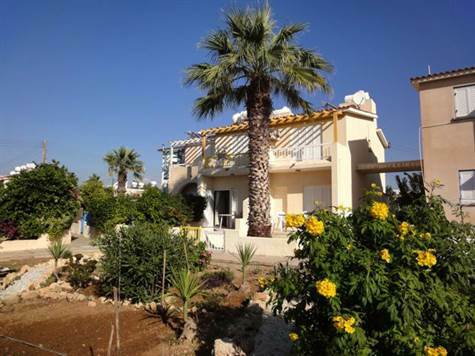 Kato Paphos, Paphos - This fully furnished two bedroom townhouse is superbly located in a quiet street a few minute’s walk from the beach and local shops, restaurants and amenities. The property features a split level living room with lounge/dining area and a separate corner kitchen. Patio windows in the lounge open onto a private terraced garden, ideal for outdoor dining and relaxing. Upstairs there are two good size double bedrooms with fitted wardrobes, and a separate bathroom accessed directly from the landing. The main bedroom has patio windows providing easy access to a balcony with lovely views of the surrounding area and local gardens. At the front of the property is a second landscaped garden which is designed with low maintenance in mind using crazy paving and decorative stones. Part of this space can be used for parking if required. The property is ideal as a holiday home or rental investment and has full title deeds.